Tebogo Sekgaile better known as Big Daddy (Events) who recently hosted Family Day Event at Potch Dam on January 1, yesterday disclosed all company funding via a short message service (SMS) sent to Thomas Ndabi of Thandase Music in a bid to tell him to stop the reporters because they are bothering the Mayor. 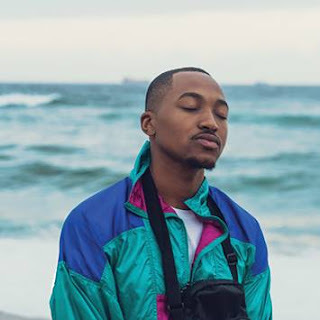 Ndabi took Big daddy Events to the papers after a long battle to get him to settle his debt of R10 000 which is a balance of a deposit he paid for Madoda and Lesego (Artists). 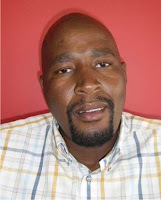 He also owes MEG securities an amount of R28 000, he is also in debts with Dj What What (R8 500, since last year), Thembi Seete and Phiri to name but a few. 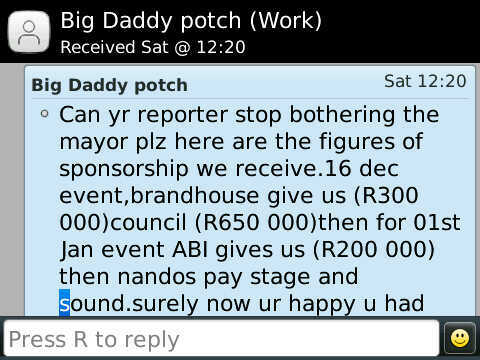 Speaking with MEG securities the initial quote that was sent to Big Daddy was R78 000, he paid R40 000 after the event. "I tried to get hold of him to settle his debt, he then told me to go to his mother's house where I got R10 000..." said Mochobo of MEG. He now owes MEG an amount of R28 000 and they are not clear when he will pay the money and this is what Mochobo got in response from Big Daddy in his bid to find out about the balance, “ He said he did not see the quotation, I then asked him what is he paying if he did not see…,” And when he asked him to check his emails he then said his laptop has crashed due to viruses and he will only be able to retrieve his emails on Monday. “I feel very bad about this thing, one must understand that it is hard to get people to work in December and we also have families, so how do you explain coming home empty handed,” Said Daniel Mochobo of MEG Securities. Big Daddy Events failed to adhere to the following quotation conditions which GoXtra News is in position of. Speaking with Thomas Ndabi of Thandase Music he said, "I feel that he is greedy and selfish," he continued, "I hate the fact that he is using the government funds to advance his personal ambitions and for his self enrichment..." He also hates the fact that he gets most of his services from artists and musicians and does not pay them at the end of the day, "It makes me sick because he does not understand the pain they go through to master their art and yet he robs them off their hard earned income it is not fair at all," he continued, " And I don't think he empowers local artists from the money that he gets from their local municipality and the fact that his business partner works for the municipality that funds their event with millions raises questions of corruption..."
"Last to promise me that the Potchefstroom municipal Mayor will transfer the money into my account with his ABSA bank account raises more questions to the whole thing even more about the circle of the people involved in this whole thing," he questioned, "Does the community know about their money that funds these events?" Yesterday we tried to get hold of Big Daddy Events and Sekgaile told us that he is at an event and we must call him the following day (Today) at 10:00am. We tried calling him several times and his phone was on voice-mail.